Donald Breaux began his career in law enforcement with the Lafayette Police Department. In 1962, Breaux then joined the Louisiana State Police where he served the state until 1980. He served as lieutenant with the intelligence section and commander of the Regional Narcotics Division. Breaux then served as the city marshal of Lafayette from 1981 to 1983 where he served as the chief law enforcement officer of the Lafayette City Court. 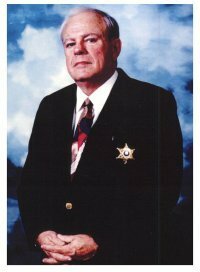 In 1984, Breaux was elected to serve the people of Lafayette Parish as their sheriff. He totally dedicated his years of experience in law enforcement to this office for the next 16 years until his retirement in 2000. Even today, Breaux continues to serve the people in law enforcement as a commissioner of the Louisiana State Police Commission, having been appointed by Gov. Bobby Jindal and Colonel Mike Edmonson of the Louisiana State Police. It is evident by his many innovations and programs that former Sheriff Breaux has a true passion for law enforcement and serving the people of Acadiana by his 42 years of outstanding service. In addition to Breaux's many years of service in law enforcement, he has also provided much of his time and efforts to several organizations. He has been a member and past president of the Louisiana State Troopers Association, where he represented 12 troop commanders and 1,200 troopers. Breaux is also a member of the Louisiana Sheriffs Association, representing 65 sheriffs and 15,000 deputies. He has also served as chairman of the National Sheriff Drug Enforcement Commission for the National Sheriffs’ Association. In helping to lead the youth, he has served on the executive committee of the Evangeline Area Boy Scouts and was the recipient of the Most Distinguished Citizen Award. Breaux has also been recognized by the State of Louisiana American Legion as Outstanding Lawman for the state of Louisiana. In 1960, Breaux married the former Anna Belle Richard from Gros Isle, Louisiana. Don and Belle have enjoyed the past 55 years together raising and watching their wonderful family grow and prosper. They are the parents of four children: Frank, Timothy, Michael, and Donna (Deceased), nine grandchildren and two great-grandchildren.